According to a new study, there are more than 30 million Americans struggling somehow with addiction. For some, it may have started with the occasional social use of marijuana at parties, for others, it could be the result of taking prescription medication for pain. Regardless of how it started, if you have lost control, you need help. Overcoming addiction is not a simple task, and there is not a simple answer that can be applied to everyone. Some people need to heal their body and minds through treatment and psychotherapy, while others require to heal their spirits. If this is your case, Faith Based Treatment could be the answer you’re looking. Your journey on the road to recovery can start today. Faith Based Treatments are different from other kinds of treatments because the spiritual element is as important as the standard methods of treatment. These traditional methods like medically assisted detox and behavioral therapy are used to help patients overcome their cravings and cope with the withdrawal symptoms. During rehab, Certified therapists give counseling and guidance during individual and group sessions. It is through these sessions that these counselors help patients regain their peace and sobriety through faith. Just like in Alcoholics Anonymous and Narcotics Anonymous, addicts in Faith Based Treatment are brought together in a tight-knit group of individuals supportive of each other. It is through this sense of community that these addicts stay sober. They also have individual and group discussions allowing the patients to engage with like-minded peers helping them to achieve and maintain sobriety. These individual and group gatherings are also complemented with guided spiritual reflection to help the patients feel supported emotionally and psychologically. How effective is a Faith Based Treatment program? 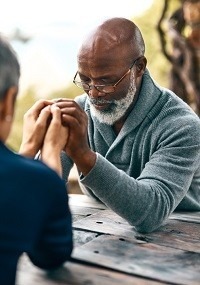 According to several studies, when compared to traditional addiction treatments in rehabilitation Centers in Colorado, Faith Based Treatment programs result in more extended periods of sobriety, fewer recurrences of using, lower rates of co-existing depression and better-coping skills. Also, people that choose faith-based drug and alcohol rehabilitation programs report having less risk for social isolation while they develop a deeper and more rewarding relation with God as well as a better emotional intimacy with their families. What Happens During and After Faith Based Addiction Recovery? The first step in entering a faith-based rehab is the drug screening and evaluation. You will be assessed to know the extent of your addiction so that the evaluators can come up with an appropriate treatment program for you. The assessment process includes interviews, surveys, blood or urine test, and physical examination. After intake is medical detox. According to DrugAbuse.gov, the purpose of this step is to help the addict safely detox from drugs or alcohol. This step is highly-recommended before an addict can proceed to the educational rehab phase. Once they’re done with detox, they will now proceed to a proper treatment wherein they will be required to attend therapy and daily counseling sessions. These processes are essential to help addicts gain insight and guidance as they tackle recovery. There will also be prayer sessions and prescription of medications to help curb cravings and withdrawal symptoms. After completing the inpatient treatment program, recovering patients will be asked to attend a number of outpatient therapies. Also, if necessary, recovering addicts will also be asked to live in a half-way house as they transition from rehab back into the real world. Aside from these, Faith Based Treatment centers offer vocational training and peer group therapy and counseling. What Are the Types of Aftercare? Half-way Houses or Sober Living Homes:These residences are designed to help recovering addicts adjust and transition from the rehab facility back into the real world. Here, the residents are kept away from drugs and alcohol and they’re expected to find work or to go back to school. Counseling and Therapy:After rehab, recovering addicts are encouraged to undergo counseling with their therapists or counselors to help them address their cravings for addictive substances. Family Therapy: Since family plays a vital role in an addict’s healing and recovery, family therapy is also offered to help the respective members to deal and cope with the adverse effects of addiction to the family. These therapy sessions can help the whole family identify ways to repair the damage caused to family relationships due to drug and alcohol, and in the process, also remove all the stress brought by addiction. Social and Physical Activities: According to DrugAbuse.gov, physical activities greatly reduce the frequency of cravings for alcohol and drugs. It is very important for recovering addicts to join clubs and groups that promote physical activities such as local gymnasiums or even yoga classes. Non-judgmental and supportive environment. At Mountain Springs Recovery, our healthcare professionals and staff are empathetic and nurturing, making the environment safe and conducive to healing and recovery. Certified therapist and highly-skilled medical staff. Since Faith Based Treatment not only dwell on the patient’s spiritual aspect but also on the physical and medical, it is important to have skilled medical staff as well as having certified and certified counselors. At Mountain Springs Recovery, you can be sure that our staf are all skilled and experts in their respective fields. They know how to handle your case with care and complete understanding. Supportive community. Given the fact that a sense of community is very important to heal and recover from addiction, Mountain Springs Recovery offers a sanctuary that is full of caring and understanding people who are there to help guide you through this tough journey. If you’re struggling from substance abuse and you feel like there’s no way out, call us today!